Between Seaford and Beachy Head you can see clifftop chalk heath, an extremely rare habitat! Coastal and marine habitats make up a small but important part of the National Park and contain some of most diverse ranges of animals and plants. The health of these habitats is as important as any on the planet. The soft chalk coastline is changing relatively quickly. This creates special pressures on the animals and plants living there. The natural world of the South Downs contains geological treasures as well as plants and animals. The marine habitats, because they are constantly being worn away, expose fossils that help us explore and understand the diversity of past life. Coastal cliffs, the shoreline and estuaries offer unique habitats that add to the diversity of present day plants and animals of the South Downs. 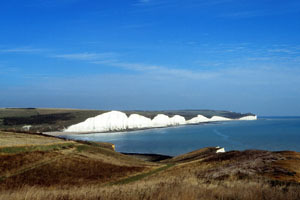 Chalk cliff tops such as the Seven Sisters and Beachy Head have typical downland habitats. Tall trees are not present and bushes are rare immediately along the cliff top. The winds are too strong. Small trees and bushes are common away from the cliff top. These grow bent away from the prevailing wind direction. Other cliff tops with sandy and muddy soils such as Newhaven have different plants and flowers. Chalk cliff faces are full of ledges along flint bands and small caves and cavities. Ledges and cavities are ideal bird nesting sites (seagulls and rock pigeons). Colonies of Kittiwakes are common at Seaford Head where ledges are eroded along layers in the Chalk. Visit the Kittiwake colony in June and July to see the downy chicks clinging to the cliff edge. Seagulls are a common sight riding the updrafts above the cliff tops. Green algae and a range of insects and spiders live on the cliff face. Waves at high tide, carrying flint pebbles, erode the bottom of the cliff so the algae cannot grow there. When the tide goes out a chalk wave-cut platform is exposed. Fossils like the giant ammonite are revealed and help to date the rocks. Fossils are used to study evolution and habitats of the ancient seas. Many animals live in the hollows and gullies in the wave-cut platform. Limpets make their own home scars on the chalk rocks by dissolving the chalk with an acidic secretion. The Limpets return to their ‘home scars’ when the tide goes out as it prevents them being removed from the rocks. Limpets graze on the green algae on the boulders and platform with their hard tongues called ‘radials’. Green-brown seaweeds and other algae grow on the wave-cut platform. The big sea-weed (Kelp) lives on the outer edge of the wave-cut platform and deeper water. You can only see Kelps at the lowest Spring tides. These ‘forests’ of algae can be detached from the rocks and washed up on beaches in heavy storms. Other leafy algal seaweeds called Wracks are common on the chalk wave-cut platform. These algal seaweeds provide protection and food for many other marine animals. Various types of non-native seaweed are invading the coastal zone habitat. These clog the filter feeding systems of colonies of Mussels and Oysters. They cannot breathe and feed and their numbers fall. Where shingle beaches have formed under the cliffs, other plants live among the ‘salty’ stones above the tide line. Sea Kale is common in these beaches. It has sweet smelling flowers loved by insects and thick waxy covering which keeps them waterproof. Wild sea kale is a legally protected species although not an endangered one. River estuaries with salt marshes are a rare habitat in the South Downs. The National Park contains four coastal plain estuaries: the Arun, Adur, Ouse and Cuckmere. All of them have been affected by development and canalisation. Estuarine habitats host a diversity of species including migrant species such as European eel and sea trout. The intertidal zone of the estuary is a haven for wading birds (Oystercatchers) and sand loving worms, shell fish and crabs. Inland, the salt marshes are made of spongy peat between muddy channels. Here herons, owls, geese, Shelduck and grebe are some of the many birds making the marsh a home. Snakes (grass snakes and adders), rabbits and foxes are common. The former meanders of the estuaries and the surrounding brackish and freshwater marshes support many rare and scarce invertebrates as well as regionally important amphibian populations, such as the common toad. These, in turn, support populations of breeding birds. Saltmarsh habitat has declined significantly in the UK over the 20th century mainly due to draining of estuaries to support port development and urban expansion. Activities such as fishing and navigational and marine aggregate dredging have had negative impacts on coastal and marine biodiversity, but focus on conservation work in recent years has helped to safeguard some marine species and habitats.